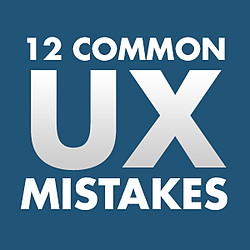 I recently attended a webinar hosted by SEMrush in which Brian Lewis, Director of Optimization at SiteTuners, outlined a dozen UX mistakes that he commonly runs across on business websites, along with suggestions regarding what can be done to rectify or avoid them completely in the web development process. Whether you already have a website and want it to perform better, planning a website redesign, or if you're in the beginning stages of creating a new business website, the information Brian provided was so helpful, I wanted to share it with you. For starters, we should define the term "UX" and what it means for web development. In short, UX stands for "User Experience." It requires a deep understanding of your users-- what they value, what they need, what they're looking to achieve while on your website. Your users are not always ready to make a purchase or request a quote after giving your home page a quick glance. Learn what is important to users on your site. Giant "BUY NOW" or "SIGN UP NOW" buttons on your home page can come off as pushy to visitors if they're not ready to convert just yet. Understand visitor intent-- a site's calls to action can accidentally suggest an attitude of "REQUEST A QUOTE OR LEAVE." Users may not be looking for a specific product, but instead might have a problem they do not know how to solve... yet. Example: for a health products site, provide "shop by symptom" category links for users unfamiliar with your specific products. It is not enough to merely display your information or services in a passive way-- you should make an effort to educate your users and help them learn what they really need. People usually have trouble keeping track of more than 7 navigation choices at any one time, so you should limit your navigation to that amount whenever possible. Display nav items in a logical order of importance-- if you have to include a Home link, don't put it in the 2nd place spot, and don't place your Blog link before your primary Products or Services. Account for misspellings. Take account of what users are actually searching for versus how products are listed and named on the site. Are your users looking for product names? Manufacturers or brands? Are they searching for specific SKUs? When a visitor looks for a specific product, don't serve up every product available on the entire site as a result, either-- too many results can be just as bad as no results. Help users understand what "featured" actually means on your site. Are they your best sellers? Highest rated products? Sale items? Check your analytics-- are users actually clicking on featured items? What is their path from there? Are they actually converting to sales/quote requests? Users are attuned to/distracted by movement over static content every time. Avoid using too many animations and auto-starting media. Don't clutter the screen with too many elements or colors. A static header tends to outperform and outconvert an animated slider in most SiteTuner case studies. Does your imagery have anything to do with your brand's products/services? Does the language actually speak to your industry or products/services, or is it just fluff about how cool you are? Does your navigation actually prepare users what to expect on your interior pages in an intuitive fashion, or is it just full of empty buzz words? It can be easy to overwhelm your users with language that they don't understand. Avoid using too many acronyms and industry terms. Only use technical jargon if your users expect it. Avoid tons of content on the home page. Break up text into smaller, more manageable paragraphs and use headers and subheaders for different content sections. Users will not bother to read a single giant block of text. Users probably won't sift through thousands of pages of products/SKUs on their phone. Design your responsive site accordingly to make your content manageable while still enabling mobile users to do what they came to your site to do. Even if a responsive site isn't showing everything, it's still downloading everything. Optimize your images! Make things easy to click and place links toward the lower half of the phone screen whenever possible to put them in reach of users' thumbs. Content adapted from a webinar by Brian Lewis and presented by SEMrush and SiteTuners.